It’s no secret that elevated stress levels go hand in hand with high blood pressure. Needless to say, this creates a situation that’s extremely detrimental to the health of your heart. Fortunately, playing a classical instrument can help you with that. The soothing benefits of this genre have been well-documented over the years. 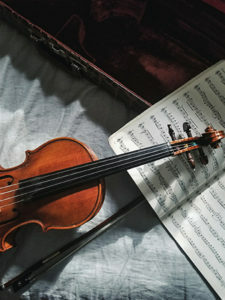 A University of California (UC) study that asked participants to listen to pop, jazz, or classical music after a challenging mental arithmetic task showed that classical music listeners had lower blood pressure. And when paired with the cathartic experience of producing the melodies yourself, you get a win-win situation. But how does this work specifically? As you may already know, stress is triggered when the brain senses a threat and releases cortisol. This hormone sends a signal to every cell in the body, which then switches on their anxiety-fueled responses. Over time, this becomes a normalized process. Making music, it appears, has the opposite effect on the body: It turns the retorts off. Did you know that playing an instrument decreases the risk of contracting various diseases by consolidating your body’s protective barriers? It was almost a decade ago when the medical community discovered the correlation between music and a stronger immune system. And lower stress hormone levels aren’t the only outcome. The research was conducted by the University of Sussex in collaboration with the Max Planck Institute in Leipzig, Germany. At first, 50 participants were tested for their responses to uplifting dance music. This already gave their immune systems a boost. But then, they were also asked to play percussion instruments. And the results were even more impressive. Receiving musical training from a young age, especially in a field as complex as the one of classical composition, prompts the brain to develop better and improves long-term memory function. Musicians tend to be a lot more mentally alert than non-musicians. Play a musical instrument? Your reaction times are likely faster than others’. Simon Landry with the University of Montreal (UofM) notes that this is an important finding. It means that playing an instrument can be used as therapy to enhance the cognition of those who are at risk. This could open up an entirely new world of possibilities when it comes to the treatment of dementia and Alzheimer’s patients. Musicians are said to have better hearing than non-musicians. According to studies from the Society for Neuroscience (SfN), musicians have better hearing than non-musicians. Although it’s true that the ears can’t change, those who play an instrument—be it classical or otherwise—train their brains to perceive sounds with more accuracy. Have you ever noticed that you’re capable of hearing your instrument clearly even when you’re performing with a full-on orchestra? It’s this type of rewiring that allows artists to pick out different sounds with enhanced acuity. Furthermore, this quality might prove to be efficient in language training for people with speech impediments, which is a huge plus. Did you know that playing a classical instrument is good for your mental health? So found Finland’s Jaakko Erkkilä with the University of Jyväskylä (UJy). His research showed that patients who participated in music therapy for three months showed significant improvements in terms of anxiety and depression levels. These patients were also observed to be handling their daily tasks better. What’s more, the benefits persisted for at least three more months after the study had ended. The control group that relied solely on talk therapy didn’t perform as well, which goes to show that music is a great outlet for negative emotions. The benefits of musical training on the mind don’t end there. We’ve already discussed them in terms of stress and anxiety, but it’s important to note at this point that melodies improve the quality of your sleep, as well. Finally, mastering the intricacies of classical music composition and execution instills you with a sense of achievement that’s hard to replicate with other activities. This will boost your self-confidence and give you something prolific to focus on. And that serves to nurture your soul and ease your mind in the process. Playing a classical instrument is the best way to learn proper posture. Cheating on this might be tempting, but you’ll notice the quality of your performance decreasing when you don’t keep your stance in mind. For example, piano players who keep their spines aligned are more relaxed. And that gives them more control over the keys and the outcome. Depending on your instrument of choice, requirements in this category vary. The one universal rule you need to keep in mind is that proper posture isn’t only beneficial to the quality of your music but also to your spinal health, as well. To avoid back pain and other complications in the future, think about that. Playing a classical instrument lowers your blood pressure, which in turn leads to decreased stress levels. On top of that, it also improves your immune system and brain function, which diminishes the risk of various diseases. Your mental health will also change for the better and so will your hearing and posture. All in all, there are plenty of reasons to convince you to consider learning a new art. So, what are you waiting for? Now is the time to start those lessons that you’ve been dreaming of but keep putting off. Jason Antoon is a music teacher with a keyboard performance certificate from California College of Music (CCM). He also runs DigitalPianoExperts, an online resource for digital piano reviews and tips.